The more I cook with oats the more I find they have an endless amount of uses. Savory oats are my latest obsession. These steel cut oats retain an al dente quality to them just like arborio rice does in a risotto. Water saute the onions over medium heat, cook until translucent then add the garlic, mushrooms, bell pepper and herbs. Saute for 5 to 20 minutes, until the mushrooms have browned and released their juices. Add in the oats and stir to prevent them from burning. Cook until lightly toasted, about 3 minutes. Add the sun dried tomatoes and 1 cup of water. Simmer over medium heat stirring often to keep the mixture from burning on the bottom. Once the first cup of water has been absorbed by the oats add a second cup of water and keep stirring. Add the third cup of water once the second is absorbed and keep stirring (isn’t risotto fun?). Once the third cup is absorbed add one more cup water (the forth) and after it’s absorbed try a piece of the oats to see if it’s cooked through. You want it to be al dente so tender but a little chewy. If it’s not tender yet add an additional cup of water to insure the oats are cooked through. They should still have a chewy texture and not be mushy. Right before serving add the nutritional yeast, salt and pepper. Don’t forget you can use the same technique to make a clean out the fridge oat risotto! I made this tonight and wow! It was awesome and surprising. It actually tastes creamy due to the steel cut oats. I would not have believed this if I hadn’t tried it myself. I substantially increased the vegetables including one red, one yellow and one orange pepper, and bunch of fresh kale and a can of artichoke hearts. I also quadrupled the mushrooms. This led me to increase the steel cut oats by 1/2 cups. The result was out of this world. I’ll definitely be making this again in spite of all the stirring. Thank you so much for the recipe! Wow, I made this tonight and it is DELISH! I just started the Eat To Live lifestyle this week and have been looking for warm dishes to compliment all the salad. This one is a winner. I’ve actually never had “real” risotto but I can’t imagine it would be better than this. Thanks for sharing!!! Cathy – I’m so glad you liked it – thank you so much for letting me know! I made this and it is very, very good. 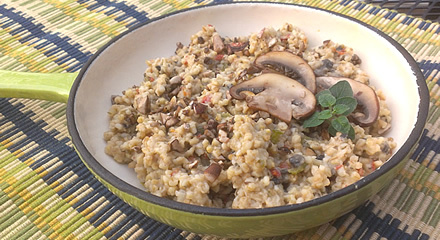 The tomatoes and mushroom seem to go very well with the nutty flavor of the oats. This is something I will make again and again. I would never have thought to use oats in a savoury setting. Super intrigued. I can’t wait to make this looks great! !